Zippitydoodahs are handmade quirky brooches made from vintage or unwanted zippers. 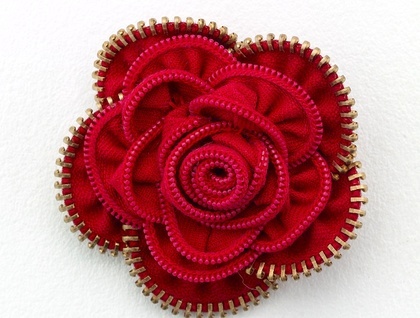 Vintage Red rose is a limited edition brooch especially for feltaid. Red roses are a symbol of love, so spread some handmade love and help out Christchurch at the same time. Each Rose is carefully handstitched from vintage red zippers. The outer petals have gold teeth that add a jewel-like sparkle. They have a brooch clasp on the back. A perfect gift or keep it for yourself! Roses will be wrapped in acid free tissue paper and bubble wrapped for protection.